I read a hardback copy of Stephen King’s Cell and it ran to a little shy of four hundred pages in length. I must confess that it took me a little while to get into the story—more than a hundred pages in fact. I am not sure why it took me so long to get an appetite for the story, but once I had got about a quarter of the way into the book I started to get curious about some of the things that were happening and from that point in I was hooked. The central character in Cell is a man called Clayton Riddell. He is an artist and is in Boston on business. For Clayton it is a very special day. Things have gone well for him and his dreams are coming true. Apart from that, it is a day just like any other. In fact, when the pulse strikes, Clayton is doing nothing more unusual than waiting in line to buy an ice cream. As Clayton awaits his Mister Softee the world around him seems to go mad. People start using strange words and attacking each other. One girl rips her friend’s neck open with her teeth and kills her. A man bites a dog’s ear off, trucks swerve to mow down pedestrians and planes fly into buildings. Chaos is everywhere and Clay quickly makes the connection: it’s the cell phones. Let’s face it, these days most people own a cell phone and some people own more than one. Everywhere you go, you see people with phones against their ears and what should be the most private of conversations are often conducted on the bus! Face it. Cell phones are now a part of everyday life and if something good, or bad, happens, people reach for their phone and start pressing the buttons. In an accident or an emergency the first thing most people do is dial the emergency services. 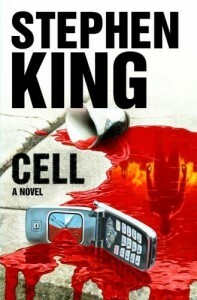 In Cell a pulse is carried across the mobile phone network and everyone that hears it either becomes insane or dies. When it happens, it happens fast; as it would in real life and for all of the reasons mentioned above. It is a scary idea. Clayton’s motivation, his quest if you like, is to get home to his estranged wife and their son Johnny, who has a little red cell phone that often lies forgotten and out of charge. Obviously Clayton hopes that, when the pulse struck, his son’s phone was not fully charged and on his person. But what if it was? Clayton’s mission remains the same throughout the book: to reach his son. There are some interesting characters to kepp Clay company on his journey. My two favourites are Tom and Alice. They are with Clay for most of his journey and I found it interesting to watch as the relationship between the three of them developed. I also found the Raggedy Man quite a unique, if intimidating, character, but if you should decide to read Cell for yourself you will have to get quite a way into the book before you meet that particular gentleman. As a final note I should mention that the back of the book contains a teaser for Lisey’s Story. I must admit that I skipped that bit. I prefer to wait. When I read it I want the full story.